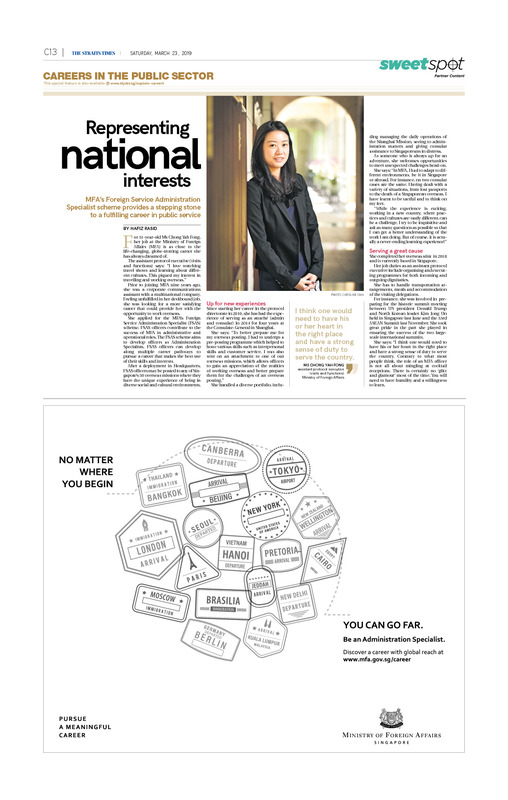 For 31-year-old Ms Chong Yah Fong, her job at the Ministry of Foreign Affairs (MFA) is as close to the life-changing, globe-trotting career she has always dreamed of. Prior to joining MFA nine years ago, she was a corporate communications assistant with a multinational company. Feeling unfulfilled in her deskbound job, she was looking for a more satisfying career that could provide her with the opportunity to work overseas. She applied for the MFA’s Foreign Service Administration Specialist (FSAS) scheme. FSAS officers contribute to the success of MFA in administrative and operational roles. The FSAS scheme aims to develop officers as Administration Specialists. FSAS officers can develop along multiple career pathways to pursue a career that makes the best use of their skills and interests. After a deployment in Headquarters, FSAS officers may be posted to any of Singapore’s 50 overseas missions where they have the unique experience of being in diverse social and cultural environments. Since starting her career in the protocol directorate in 2010, she has had the experience of serving as an attaché (admin and consular) in 2014 for four years at the Consulate-General in Shanghai. She handled a diverse portfolio, including including managing the daily operations of the Shanghai Mission, seeing to administration matters and giving consular assistance to Singaporeans in distress. As someone who is always up for an adventure, she welcomes opportunities to meet unexpected challenges head-on. She says: “In MFA, I had to adapt to different environments, be it in Singapore or abroad. For instance, no two consular cases are the same. Having dealt with a variety of situations, from lost passports to the death of a Singaporean overseas, I have learnt to be tactful and to think on my feet. She completed her overseas stint in 2018 and is currently based in Singapore. Her job duties as an assistant protocol executive include organising and executing programmes for both incoming and outgoing dignitaries. She has to handle transportation arrangements, meals and accommodation of the visiting delegations. For instance, she was involved in preparing for the historic summit meeting between US president Donald Trump and North Korean leader Kim Jong Un held in Singapore last June and the 33rd ASEAN Summit last November. She took great pride in the part she played in ensuring the success of the two largescale international summits. She says: “I think one would need to have his or her heart in the right place and have a strong sense of duty to serve the country. Contrary to what most people think, the role of an MFA officer is not all about mingling at cocktail receptions. There is certainly no ‘glitz and glamour’ most of the time. You will need to have humility and a willingness to learn.